Union Presbyterian Seminary was founded in 1812 with a mission of preparing men and women to serve the church as pastors, educators, scholars, chaplains, and missionaries. Today the seminary fulfills this mission with two campuses and an online program. UPSem is a well-known and respected institution in theology, but needed to appeal to a wider audience of prospective students. 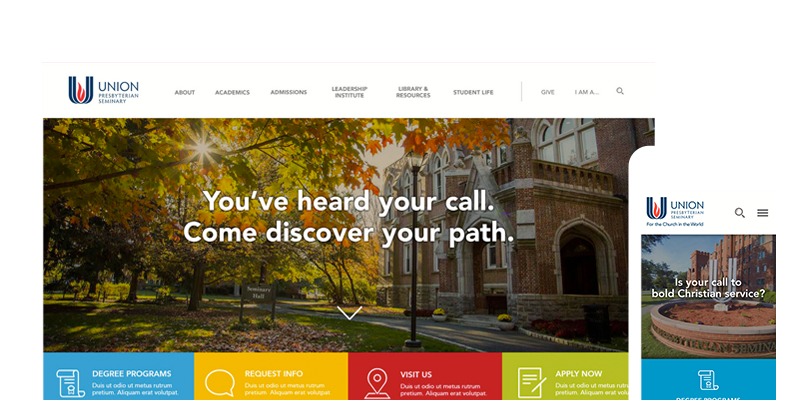 UPSem selected HeliumStudio to create a more contemporary website to attract new students. In addition to making clear calls to action, we incorporated a drone video on the homepage to highlight the beauty of the campus. We added new features such as photo galleries, calendaring, online giving, and blogging. We also built the site as mobile responsive to accommodate tablets and handheld devices. The outcome was extraordinary, resulting in the 20% increase in applicants from the previous year. Copyright © 2004 – 2019 HeliumStudio, Inc., All Rights Reserved.